Welcome to the first installment in our new series, Onely B*tchslaps Mother Nature, where we decry instances of discrimination against singles–in the natural world. Onely’s regular readers know we hate it when couples are privileged over us singles. We hate paying more than couples at the gym. We hate that the beneficiaries of our IRAs have to pay taxes on that money, just because they’re not our spouses. We hate movies where the hero’s life magically becomes all hunky-dory just because she pairs up with someone. We hate singlism, and we’ve encountered a lot of it in our time. But at least no one has ever tried to kill us because we were single. Cannibal shrimp are so hell-bent on living in pairs that when placed in groups of three or four, they attack their peers until just one couple remains alive. No matter what your stance on marital status discrimination, you have to admit that would make a really gripping reality show. P.S. Yes, all you taxonomists out there, that photo is not actually of cannibal shrimp. 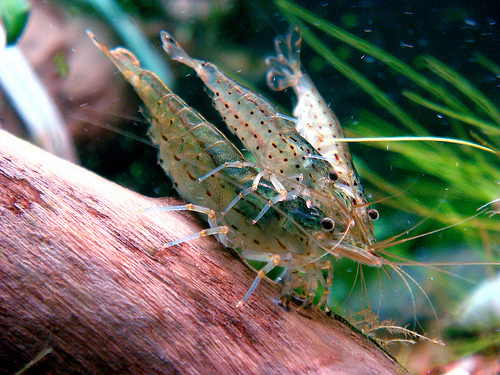 It’s a copulation between two male and one female Amano shrimp, who are apparently much more freespirited and less heteronormative than cannibal shrimp. I laughed… especially at the PS! I didn’t see the third shrimp until I read the PS!! Does that make threesomes “natural”?